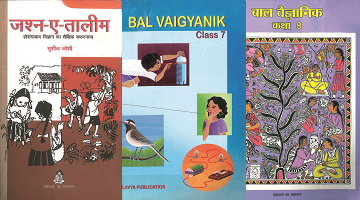 A collection of short folktales, compiled from various parts of Madhya Pradesh. Intricate black and ..
A collection of short folktales, compiled by Primary Language Teaching Programme, Eklavya. Stories h..
A Social Studies module, written in easy, comprehensible language systematically introduces children..
भाषा शिक्षण से सम्‍बन्धित गतिविधियां। जिनके जरिए बच्‍चे में कई दक्षताएं विकसित की जा सकती हैं। चित्र..
History means a lot more than merely stories of kings and battles, taxes and treaties – full of stra..